How do you make Music City USA even more exciting? Set up a new stage for people to play. W Hotels Worldwide, part of Marriott International, today announces the anticipated 2020 opening of W Nashville. Owned by Twelfth Avenue Realty Holdings, the new-build hotel is the latest North American development in the brand’s packed line-up of extraordinary new hotels across the United States and beyond, including the soon to open W Aspen and W Philadelphia. Known for pushing the boundaries of modern design, W Hotels and leading architecture and design firm, Rockwell Group, will infuse the rich culture and musical legacy of Nashville into every aspect of the property. Located in The Gulch, a newly revitalized, LEED-certified, upscale live-work-play neighborhood in Nashville that has become a go-to destination for music lovers, shoppers and business travelers alike, W Nashville will take on the spirit of the city through creative and innovative design. The Living Room (the brand’s take on the hotel lobby) will reinterpret elements of Nashville’s renowned civic amphitheaters and legendary recording studios. The expansive gathering space, complete with full bar and DJ booth, will provide both intimate and open settings, while local artwork will be showcased around every corner. But local talent won’t just be featured on the walls – it will be heard throughout the hotel as W Nashville will host a constant lineup of new and next musicians at its on-site live music venue. And of course, since it’s a W, bigger national acts are sure to make stops while they are in town. W Nashville will boast two dining concepts from renowned Chef Andrew Carmellini of NoHo Hospitality Group, bringing The Dutch Nashville as well as an evening-only prime Italian chophouse, which will serve up classic steakhouse dishes with a twist next to a glass-walled kitchen. 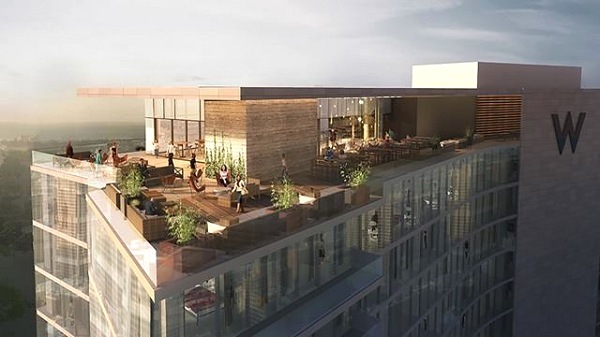 The new hotel will tempt guests with a history-meets-modern rooftop bar, where sweeping views of the Nashville skyline will be complemented by wood paneling, a central fireplace, and sliding garage doors along the perimeter. W Nashville will feature 346 guestrooms including 50 suites and two Extreme WOW Suites (W’s take on the Presidential Suite), one of which will be a spectacular 1,668-square-foot penthouse. For those looking to throw their own party, the hotel’s 13,500 square feet of flexible meeting and event space, as well as a 5,000 square-foot pre-function space and 3,600 square feet of event terrace space, will delight with stunning design and advanced technology. Rounding out the amenities will be a state-of-the-art FIT® gym with a yoga lawn; a 9,700 square-foot WET Deck (pool) complete with luxe cabanas, grill and a poolside bar sure to shake up Nashville’s social scene; and, of course, the W brand’s iconic Whatever/Whenever® service delivering guests whatever they want, whenever they want it (so long as it’s legal). W Nashville is set to join more than 50 W Hotels now open globally, including the recently opened W Brisbane, W Amman, W Panama, and W Shanghai – The Bund, as well as the soon-to-open W Costa Rica and W Kuala Lumpur. W Hotels is on track to have 75 hotels globally by the end of 2020.